Classic Northeast Kansas hunting in bow and gun friendly cover. Classic or common unit 9 and 10 hunting land. Mixed crops. Lightly wooded drainage’s Small wood patches. The aerial above is 160 acres at 1/2 by 1/2 mile square. This is the average sized spot for one hunter. There are more places for stands than most will place. We could show more aerials within this unit, however they have the same components in varying amounts. Some have more woody cover. Some are all crop fields. This aerial represents the middle. 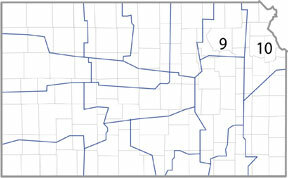 Units 8, 9 10 and 11 are similar. They all have more deer hunting spots than any deer hunter could cover in 10 years. The challenge is to the human eye they appear similar. Even when finding the best looking funnel isolated from human road or farm yard observation, with great multi season adjoining food sources with a year round water source often proves less confident building by lack of trophy deer on trail cameras. All should learn the lessons of those that have walked this ground. Put the trail cameras on likely and not so likely spots. Most learn that Mister Whitetail is far more likely to travel where he wants to than where the hunter would like him to. Northeast Kansas hunting deer management units 9 and 10 are within the most heavily wooded region of Kansas. That description by itself will set up unreasonable expectations of what to expect. Heavily wooded in Kansas means far less woods than most other states. A furtherance of that description is that units 8, 9 10 and 11 offer the most bow friendly land. Or, that area where an abundance of trees exist offering many tree stand locations. These four Kansas deer management units also have the highest Whitetail Deer densities within the the state. On the other side these eastern Kansas management units are also the most density human populated. That is for Kansas. Most traveling hunters do assess that rural Kansas has far fewer human residents than their home state. The larger towns within these deer management units. 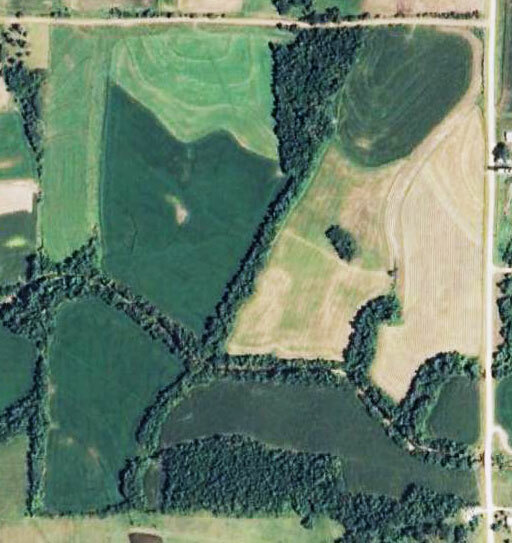 Marysville Kansas sits on the boarder between deer management units 8 and 9. 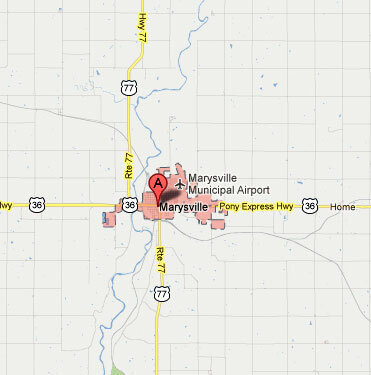 Marysville is the largest near city like Kansas rural town in both units 8 and 9. If traveling through Marysville the local grocery stores would be the place to stock up on fresh fruit. Fresh fruit is a hard to come by resources in much of Kansas. Any hunter on a week or longer trip will soon learn the better restocking points. Marysville also has special large Kansas town status by its having a super WalMart. For those traveling out while on the road getting that flash memory of having forgotten a key piece of clothing or equipment the Marysville WalMart represents the best chance of finding a replacement outside of the Cabala’s in Kansas City. Characteristics of many Kansas towns positioned along one of the better Kansas Sate highways is the town’s main street is offset from the highway. 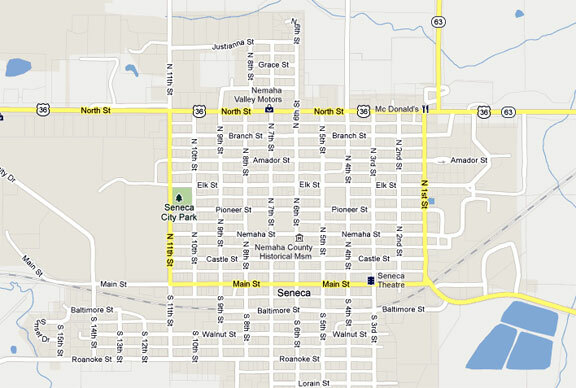 That is well shown by this map of Seneca Kansas in the heart of deer management unit 9. This duality of a Main Street separate from the high traffic highway all within the same town means commercial business will be located on both. Some of the better restaurants may very well be on Main Streets completely hidden from highway view. All Kansas towns listed on these Kansas deer management unit pages are those nearest to the bulk of Association deer lease land. They are the locations to find the most support in terms of lodging, camping, veterinarians, meat lockers, restaurants and other food supplies. Atchison, Kansas is the place to lodge when hunting in unit 10. Atchison is large with a wide choice of motels, restaurants and a super WalMart. A very easy to support any hunting trip if hunting the Association’s deer management unit 10 lease land. 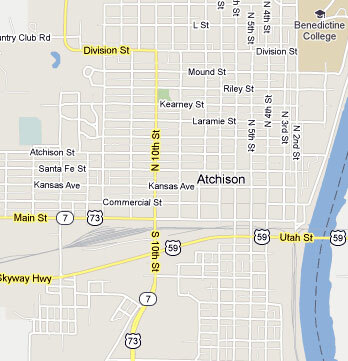 Atchison is also a river crossing point to the east easily allowing a two state hunt.